From one side to the other, the lips should be symmetrical for a pleasing appearance. 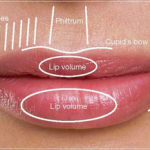 The Cupid’s bow is most attractive when it is well defined, serving the focal point of the upper lip. A line drawn upward from the corners of the lips should hit the center of the pupils of the eyes. Your Healthcare professional has the training and education to create a natural effect using Restylane. Talk to him or her about the best way to prepare for your treatment and what to expect afterward.